“Sorry, we are closed now for a wedding ceremony”, it was so disappointing to hear that after walking for three blocks to the Notre-Dame Basilica from the parking. “So, when will it be open to public?” I asked. “Between 6:30 to 8 p.m., it will be open for everyone.” That was relieving. Well, it wasn’t that bad as we got more time to explore Old Montréal. Walked by the famous historic buildings and time just flew by. We were back at the square and imagined that there would be lines to enter the Basilica but surprisingly, it was all quick moving and we didn’t have to wait. 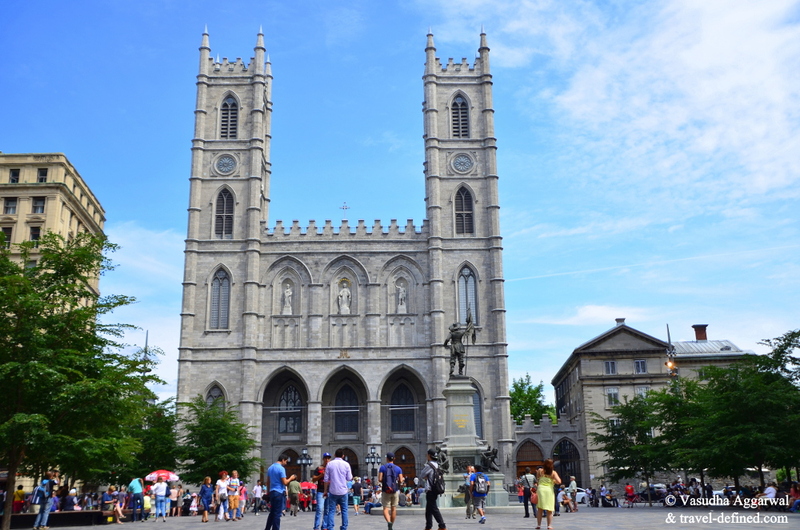 This Gothic revival style Basilica was completed in 1829. Its architecture is truly impeccable, designed by James O’Donnell, an architect from New York. And the Interior is equally magnificent. The moment you enter this cathedral, its like stepping into a magical world. 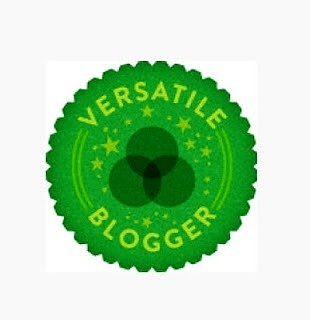 Its fascinating – the colors, the designs & the entire ambiance transports to a different experience. The interior decor with the wood & gold leaf work is beautifully impressive. The Altar is the centerpiece of the Basilica and is a marvelous work of art. The meticulous carvings, spectacular sculptures, and the tranquil lighting – it all combines to create this heavenly sight. We were speechless when we saw this altarpiece, and were so happy to have waited to see this unforgettable Basilica. It was difficult to look away and we just sat there admiring the beauty. On the opposite side of the altar is the 7000-pipe Casavant organ built in 1891 – and is definitely not to be missed. Rebuilt in 1982 after being destroyed by fire in 1978, its bronze sculpture piece is wonderfully crafted. Consisting of 32 bronze panels, the design is so different from any other and is truly built for Royalty. This Chapel is mainly used for smaller ceremonies and that day, it was decorated with white flowers & looked even more beautiful & this is where the wedding took place because of which we had to wait to see the basilica. Along with the altar, the stained glass windows made the interior look even more regal. 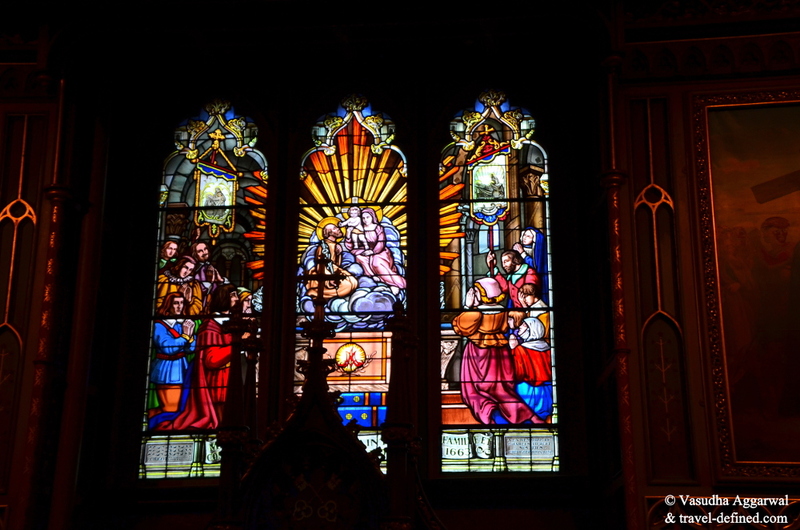 These windows showcase Montreal’s Religious and social history. 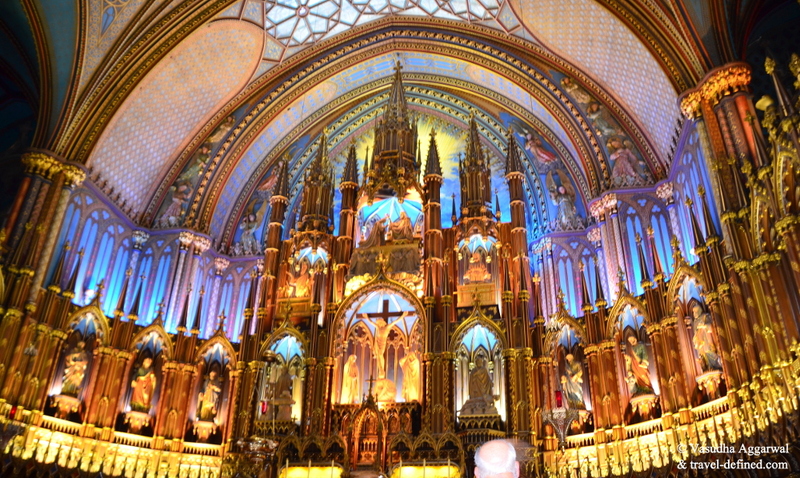 And we clicked a few pictures of this colorful part of the Basilica and here’s one of those. The multi-colored glass windows really popped against the dark background and presented a lovely picture looking back at history. 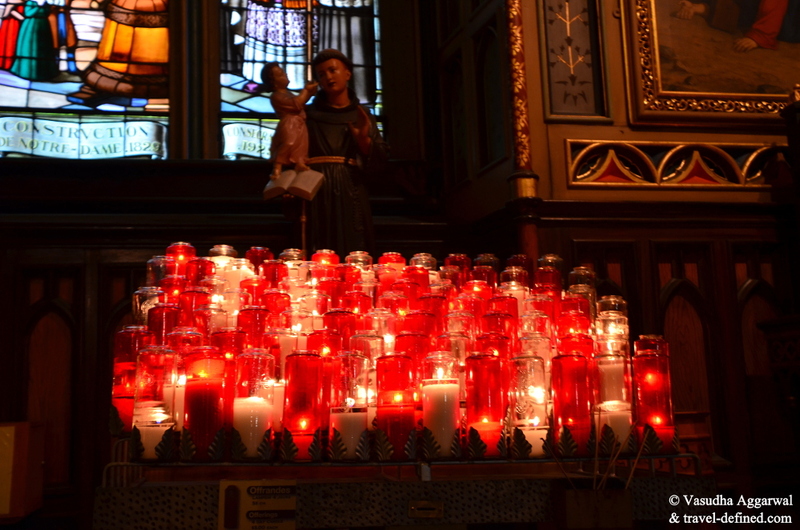 And we totally loved the red, white and yellow glow of the candles. These added that touch of human faith in the divine. 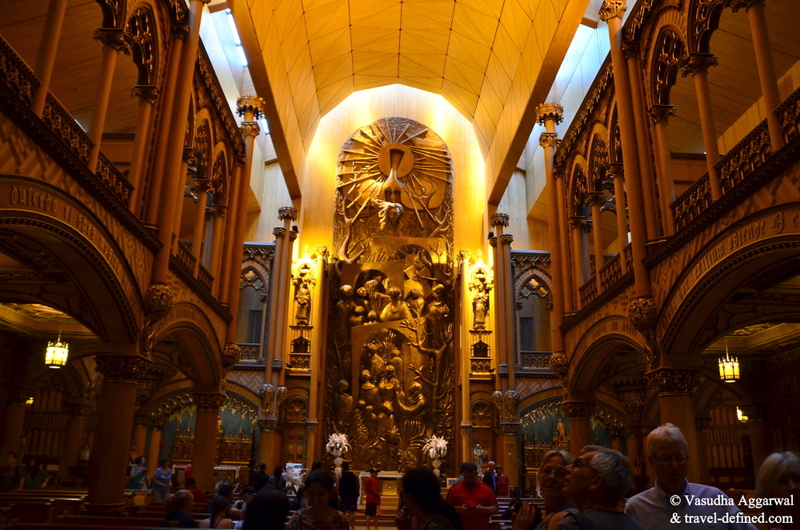 We enjoyed our visit to the splendid Notre-Dame Basilica in Montreal and were totally awe-inspired by its beauty and grandeur. Hours – From 8 a.m. to 4 p.m. with exceptions such as summer and winter hours are different or special occasions – for details please check their website. From the outside, looks quite plain but amazing detail and colours inside! Its a beautiful structure both inside and out. Definitely, the colors inside are breathtaking. My goodness, can you imagine actually getting married here? What a stunning work of art. Seriously, a wedding here must be so amazing. But living in Montreal, must be such a wonderful experience. Good that you got to see the interior! Yeah, am so glad I got to see this beautiful Basilica.